This set of Network Theory Multiple Choice Questions & Answers (MCQs) focuses on “Resonant Frequency for a Tank Circuit”. 1. For the tank circuit shown below, find the resonant frequency. Explanation: The parallel resonant circuit is generally called a tank circuit because of the fact that the circuit stores energy in the magnetic field of the coil and in the electric field of the capacitor. The resonant frequency fr = (1/2π) √((1/LC)-(R2/L2 ) ). 2. The expression of ωr in parallel resonant circuit is? Explanation: The stored energy is transferred back and forth between the capacitor and coil and vice-versa. The expression of ωr in parallel resonant circuit is ωr = 1/√LC. 3. The expression of bandwidth for parallel resonant circuit is? Explanation: The expression of bandwidth for parallel resonant circuit is BW = 1/RC. the circuit is said to be in resonant condition when the susceptance part of admittance is zero. 4. The quality factor in case of parallel resonant circuit is? Explanation: The quality factor in case of parallel resonant circuit is Q = 1/ωrRC. The impedance of parallel resonant circuit is maximum at the resonant frequency and decreases at lower and higher frequencies. Explanation: At low frequencies XL is very small and XC is very large so the total impedance is essentially inductive. The quality factor is the product of 2π and the ratio of maximum energy stored to energy dissipated per cycle. 6. The maximum energy stored in a capacitor is? Explanation: The maximum energy stored in a capacitor is CV2/2. Maximum energy = CV2/2. As frequency increases the impedance also increases and the inductive reactance dominates until the resonant frequency is reached. 7. The expression of quality factor is? Explanation: The expression of quality factor is IL/I. Quality factor = IL/I. At the the point XL = XC, the impedance is at its maximum. 8. The quality factor is defined as? Explanation: The quality factor is defined as IC/I. Quality factor = IC/I. As the frequency goes above resonance capacitive reactance dominates and impedance decreases. 9. In the circuit shown in the figure, an inductance of 0.1H having a Q of 5 is in parallel with a capacitor. Determine the value coil resistance (Ω) of at a resonant frequency of 500 rad/sec. Explanation: Quality factor Q = ωrL/R. L = 0.1H, Q = 5, ωr = 500 rad/sec. On solving, R = 10Ω. While plotting the voltage and current variation with frequency, at resonant frequency, the current is maximum. 10. 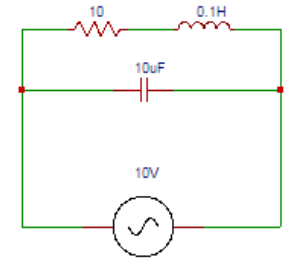 Find the value of capacitance (µF) in the circuit shown in the question 9. Explanation: ω2r = 1/LC. L = 0.1H, ωr = 500 rad/sec. On solving, C = 40 µF. 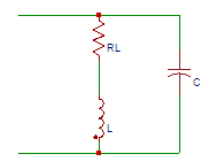 In order to tune a parallel circuit to a lower frequency the capacitance must be increased.